With the advent of GDPR there will be no more buying email addresses and blanket marketing to them. So that begs the question; how will you increase subscribers to your mailing list? You know you need more subscribers because subscribers mean people looking at your work and people looking at your work means more sales. So what can you do? It’s a bit like the chicken and the egg scenario. Why send out a newsletter if you have precious few subscribers? Alternatively, why ask people to subscribe to something that doesn’t exist yet? 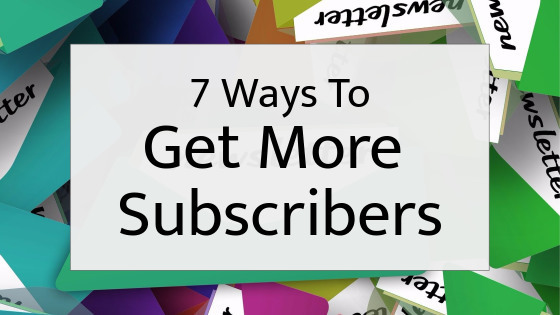 It’s a conundrum many of us face so I’ve put together here 7 ways you can increase subscribers to your list. Some of these are one-off jobs, others will take a little more work but working together they should help you build up that list of current and potential clients. Have a link on each page on your website. Have a pop-up on your website asking people to subscribe. These are annoying but they do work. At the top of your Facebook page, there is a button. Change this to “sign-up” with the link to your mailing list. Have your offer and link to your mailing list on your Twitter profile. In the signature area in the bottom of your emails add a link asking people to subscribe. Send out social media posts highlighting your offer with the link to sign-up or directing to a sign-up page. Ask people. If someone gives you a business card you can send them an email to ask them to subscribe. If you run a stall or exhibition stand have a printed form for visitors to fill in asking them to subscribe. Keep copies of this form, photograph it as it will be your proof of consent if asked. You can also do this digitally. Hopefully, that has got you thinking. You will probably come up with more ideas to increase your subscribers, if that is the case, please share them in the comments section below. All of these things take time. If your time is better spent elsewhere, you can always ask your VA (winks conspiratorially) to do these things for you. Still too much? Why not learn how I can help you with an Anxiety-Free GDPR Compliant Newsletter?